Among the international flags representing the nationalities of the women’s soccer team hung in front of Walt Chyzowych Alumni Hill there was a new flag flying during Sunday’s game: a pride flag. The pride flag was hung in honor of team member Bri Carney’s Senior Game, as each senior player gets their own special Senior Game at Spry Stadium during their final season. For the event, Carney and her teammates also sported rainbow wristbands, scrunchies and ribbons. “[It was] very moving for me to see people in support of something I identify with, and seeing validation through that was really cool for me personally and for the community in general,” Carney said. However, Carney’s Senior Grame cannot officially be labeled “a pride game,” like she had originally envisioned it. In the midst of planning the event, Carney and her team were met with push-back from administrators over various concerns. She and her teammates conceived the idea for a pride game back in April, after seeing that Duke women’s soccer team hosted one last year. Once the soccer season drew closer, Carney and her teammates tried to turn her vision into a concrete plan. Two weeks before the Sept. 23 game against Notre Dame, however, Carney met with the Director of Athletics Ron Wellman, who had heard of the team’s plan for a pride game. According to Carney, Wellman was afraid that the pride game would “open Pandora’s box” for the Athletics Department, as this could potentially set a precedent for other sports teams to use their games to support certain causes. She said that the Athletics Department therefore did not approve of the idea, and would not buy pride-themed items. ““[There is] a long-standing policy for events to not be taken over for any cause of any kind,” said President Nathan O. Hatch. However, Carney’s coach told her that they would take it out of the team’s budget instead to purchase the wristbands, scrunchies and ribbons they sported during the game. Additionally, the Athletics Department partnered with Wake Forest’s LGBTQ Center to have the Center’s staff serve as guest coaches and to hold a table with materials, information, and resources and LGBTQ Center swag at the event. Prior to her meeting with Wellman, Carney had created an online statement of support for the game through Google forms, and circulated it among her teammates and friends, asking them to sign it and share it if they felt so inclined. As of Sept. 26, the statement had 1,216 signatures from not only Carney’s network, but also from UCLA’s women’s soccer, Georgetown’s women’s soccer, and Tennessee’s women’s soccer among others universities’ athletic teams. Although the game was sponsored by the LGBTQ Center, it was never officially referred to as the “pride game” on social media. 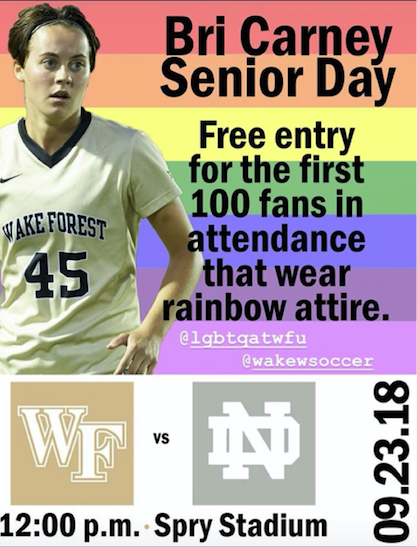 Fliers and social media posts, offering free entry for the first 100 fans wearing rainbow attire and featuring a photo of Carney with a rainbow background, were promoted by official university accounts, not the Athletics Department or women’s soccer team. Carney expressed frustration that, in these advertisements, the focus was largely on her and not on pride. “I would rather it have been advertised as a women’s soccer pride game, that Athletics supports this rather than Bri Carney supports this,” Carney said, elaborating that she had chosen her Senior Game for the event so as not to take the spotlight from a teammate’s senior game. After meeting with Wellman, Carney said that she felt that she had to go with what she was told, citing that “there wasn’t really time to fight that battle” ahead of her Senior Game on Sept. 23. “It seemed to me that [the Athletics Department] just wanted to tip-toe it and weren’t ready to commit to [a pride game], but they wanted, at the same time, to support their athletes and were trying to find that balance,” Carney said. Angela Mazaris, director of the LGBTQ Center, served as a guest coach for the game, and expressed her support for Carney and for the event as a whole. Mazaris applauded Carney and her efforts, noting that having her Senior Game sponsored by the LGBTQ Center was a big step. “I would love to see other teams really think about how they are supporting both their LGBTQ players and LGBTQ fans and the broader community … It’s a way of saying to athletes everywhere, ‘if you can play, you can play. It doesn’t matter if you’re gay, it doesn’t matter if you’re bisexual, it doesn’t matter if you’re trans, if you’re queer, or if you’re questioning,’” Mazaris said. In her original statement, Carney expressed how a pride game would be consistent with the university’s mission and policies on diversity and inclusion, so she hopes that she can help the Athletics Department take another step forward.